Map of Chantilly's approximate location superimposed on Dulles Airport's current borders. Chantilly was established by plantation owners in the late 18th and early 19th centuries. Chantilly's land primarily originated from a 3,111-acre tract of land claimed by Henry Lee I in 1725 and an adjacent 4,142-acre tract of land claimed by George Turberville in the 1730s. In 1794, Lee's grandson Richard Bland Lee constructed the Sully Plantation on the his grandfather's tract. Simultaneously, Turberville descendant George Richard Lee Turberville constructed Leeton Grove (located approximately 2.2 miles to the south of Sully) on his family's tract. It was in between these two homes that Chantilly was established along the Little River Turnpike, a straightaway constructed in 1805 connecting Alexandria to Winchester. The village gained its name from the nearby Chantilly Farm, constructed by George Richard Lee Turberville's son-in-law, Charles Calvert Stuart, in the 1820s. Chantilly grew as a close-knit agricultural community through the 19th and 20th centuries. Sully's neighbor, Turley Hall, in later years. In the 1850s, the Virginia General Assembly chartered the construction of the Loudoun Branch of the Manassas Gap Railroad, which was to connect Fairfax, Virginia to Harpers Ferry, West Virginia. As such, the railroad was set to cut through Chantilly. Jacob Haight, Sully's owner at the time, assured his skeptical neighbor, Charles W. Turley, that the railroad (which was set to cut through Sully and Turley Hall's land) would provide economic benefits to the region. Unfortunately, Turley's doubts on the project were with merit, as construction was halted due to financial problems and the outbreak of the Civil War. Chantilly was the site of much military activity during the American Civil War. The Chantilly estate was used as a station for federal troops and was a significant landmark during the Battle of Ox Hill on September 1st, 1862. Colonel John S. Mosby was said to have attacked a post in Chantilly, inciting a skirmish between Confederate and Federal troops along Little River Turnpike. The Chantilly Estate was burned down in 1863. Following the war, a number of Confederate rangers serving under Mosby settled in and around Chantilly, including Lt. Albert Wrenn, who built and ran a general store located on Little River Turnpike in 1867. Several families ran this store through the next century. The other "Leeton," demolished in 1960 for the airport's construction. Between 1958 and 1962, Dulles Airport's construction consumed a considerable amount of Chantilly farmland. The airport unofficially took the name "Chantilly" until it was named for the late Secretary of State John Foster Dulles. Sully's neighbor to the west, an early 19th-century farm also known as "Leeton" (no relation to the Turberville Estate) was lost to demolition in 1960. Economic change propelled the transformation of Chantilly from a rural to a suburban locale during the second half of the 20th century. The Rockland Village and Chantilly Farms subdivisions located along Route 50 introduced tract housing to Chantilly in the 1950s. Most of the village's original establishments were demolished and replaced with similar tract-based residential and commercial developments in the 1970s and 1980s. Chantilly Episcopal Church was demolished in 1963 due to structural issues. Albert Wrenn's general store was lost to an electrical fire in 1981. Charles Turley's estate was lost to fire in the 1990s. Chantilly continues to grow as a suburban community today. A number of aerospace and defense firms such as General Dynamics and Northrop Grumman have made their home in Chantilly, as well as the National Reconnaissance Office (NRO). While Chantilly's landscape has changed tremendously since the start of the Cold War, certain edifices of Chantilly's past remain. Local protest during Dulles's construction prevented Sully's demolition, and the Fairfax County Park Authority (FCPA) has opened the plantation to the public as a museum. Leeton Grove, the Turberville estate, remains standing in private ownership. 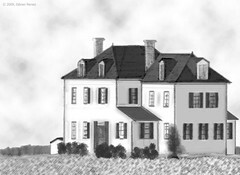 A c.1820 stone house once belonging to Chantilly farm now stands as a part of the International Country Club. Along with these buildings exist a number of family cemeteries hidden amidst office parks and residential subdivisions. "Salisbury Plain Marker," last modified March 1, 2008, http://www.hmdb.org/marker.asp?marker=4533. Robert Gamble, Sully: The Biography of a House (Fairfax, VA: Sully Foundation, 1973), 26-32. Gamble, Sully: The Biography of a House, 39. Gamble, Sully: The Biography of a House, 59. "Northern Virginia History Notes," last modified November 28, 2008, http://novahistory.org/Chantilly.html. Margaret Peck, Voices of Chantilly (Chantilly, VA, 1996), 135-137. Gamble, Sully: The Biography of a House, 84. "Loudoun Branch, Manassas Gap Railroad Marker," last modified April 22, 2008, http://www.hmdb.org/marker.asp?marker=7278. James Joseph Williamson, Mosby's Rangers, a record of the operations of the Forty-third battalion of Virginia Cavalry from its organization to the surrender (New York, Sturgis & Walton, 1909), 477. Margaret Peck, Voices of Chantilly (Chantilly, VA, 1996), 69. Peck, Voices of Chantilly, 158-164. Gamble, Sully: The Biography of a House, 119. "History of Dulles Airport," last modified 02-22-2010, http://www.loudounhistory.org/history/dulles-airport-history.htm. Gamble, Sully: The Biography of a House, 134. Gamble, Sully: The Biography of a House, 118-119. Peck, Voices of Chantilly, 72.